The IC-M85E is an ultra-compact and powerful Marine Handheld with LMR Features. Do not let the small size fool you. 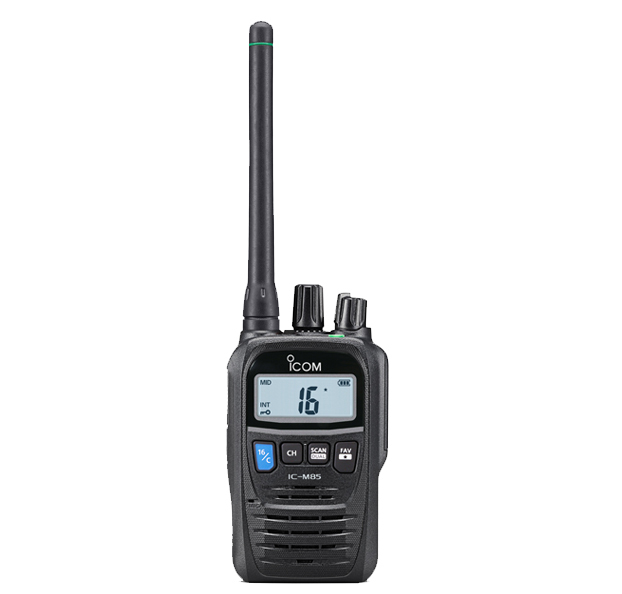 The IC-M85E is the most compact (W×H×D: 56 × 92 × 29 mm) and lightweight (weight: 246 g) (with BP-290, FA-SC58V and MBB-3) commercial grade marine and land mobile hybrid radio in the world*. The Professionals Choice! Automated Emergency Alarm – Includes: MOB (Man Over Board), Man Down and Lone Worker. 700 mW Powerful Audio – For vital clear communication in those noisy environments. Private Conversation – Built-in Voice Scrambler and provides private communication between stations (32-code, compatible with UT-112 voice scrambler unit). The radio also comes with a variety of other features including Aqua Quake ™, internal VOX capability for hands-free operation, 14 hours of battery life, 5W Output, Dual/ Tri-watch function for monitoring CH16 and/ or call channel, etc. *As of November 2017, researched by Icom.